Nothing is going right for the Philadelphia Phillies. Having dropped seven straight series, the Phillies have lost 17 of their last 21 contests and have scored more than five runs just once in their last nine games. Sunday's loss in Pittsburgh was really tough to swallow considering the lone run of the contest was scored by the Pirates after starter Aaron Nola loaded the bases and proceeded to hit David Freeze with a pitch to force home the winning rum. 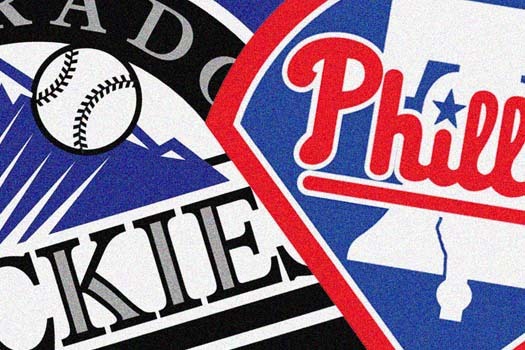 Things don't get any easier this week as the Colorado Rockies roll into Philadelphia with a 28-17 record, the best mark in the National League. I caught up with Richard Bergstrom Jr. (@rbergstromjr) of Purple Row to get his take on the Rockies early season success. They have a much more robust bullpen than last year. They're putting up runs on the road and they're getting some situational hitting to go along with that. 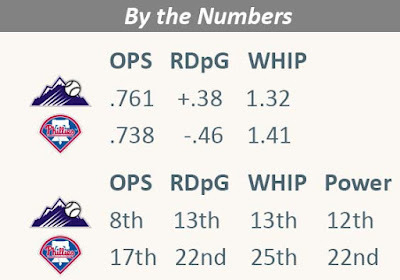 Keep in mind that they are doing well in 2017 despite a lot of spring training and early season injuries including losing two starting pitchers (Gray and Bettis), two catchers (Murphy and Wolters), their shortstop (Story), an outfielder (Dahl) and [utility player] Desmond. Usually depth has been an issue for the Rockies but they've managed to hold it together well so far. Reynolds is an interesting case. Most players learn how to hit the ball, then later in their career, learn how to pull the ball and hit for power. Reynolds basically did the reverse, hitting for power early in his career before deciding last year to adapt his approach to make more contact. It seems this year he's putting both parts together and while he's unlikely to remain this hot, most of the gains should be sustainable. So, I doubt he finishes the year as the best Rockies hitter. That title should go to Nolan Arenado with Charlie Blackmon as a close second. But when you combine his contact, power, eye and his above average defense, he's been a tremendous asset and it's likely he's in for a good pay day after this season. The bottom of the lineup has actually been pretty dangerous as Tony Wolters has done a good job of getting on base, setting things up nicely for Charlie Blackmon to drive runners in. Though the Rockies haven't done much in terms of stolen bases, every lineup regular except for Arenado has at least average speed. With doubles power sprinkled up and down the lineup, if someone gets on, there's a high chance they get driven in.